I recently reviewed a paper, Field-testing ecological and economic benefits of coffee certification programs, that included a summary table of the criteria used for shade certification by Rainforest Alliance, and Smithsonian Migratory Bird Center (under the “Bird-Friendly” trademark). I thought it would be useful to post a summary here, with a little commentary. 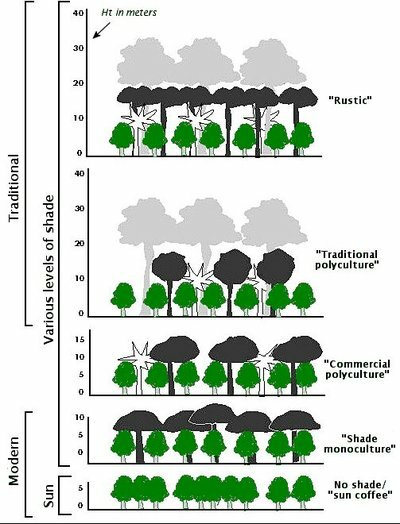 SMBC’s criteria are mandatory, while RA has no required criteria for shade management — the standards below are one of the optional criteria (more on the RA standards and scoring can be found here). *As of April 2009, standards were modified from the previous version, February 2008. In the old standards, one requirement was for at least 12 native tree species and at least 70 trees per hectare; now it is an average of 12 native tree species, with no minimum number of trees per hectare. Previous criteria stated a minimum of 40% shade cover, now the standard specifies this minimum only on cultivated land. As noted in the previous post, the criteria having to do with vertical stratification — the number of layers of vegetation and the leaf volume in each — are critical components for preserving a rich mix of species. Many ecological studies support the key role of structural diversity (sometimes referred to technically as floristic heterogeneity) in increased biodiversity — of many types in many ecosystems well beyond the realm of coffee growing. This is the classic schematic illustrating the various coffee production systems and their layers of shade diversity, from a paper by Patricia Moguel and Victor Toledo . As you can see from the table above, Rainforest Alliance requires (if this criteria is used) only two layers of shade, while Smithsonian requires three. RA has no standards for leaf volume in the shade layers. In short, RA certified farms that use these criteria would have still have structurally-simpler habitats (closer to commercial polyculture) that would likely not support as much biodiversity as farms that met SMBC criteria (closer to traditional polyculture). A further note. SMBC inspectors visit farms and set up a number of plots and measure various vegetation parameters following methods used in typical ecological studies. The aforementioned paper reports that “Rainforest Alliance inspection auditors rely heavily on data provided by farm managers” (who are not ecologists), and confirm data provided during visits by various estimates and extrapolations. As an ecologist myself, I am more comfortable that SMBC offers the more stringent, reliable assurance that coffee is grown sustainability if one is comparing certification schemes. And not to beat a dead horse, but the usual caveats apply: there are pros and cons of certification, and many uncertified farms grow coffee sustainably, meeting or exceeding the strongest criteria. More on SMBCs criteria here, and in the “certifications” category of C&C. I am currently working with small scale farmers in the Ecuadorian highlands and we have recently become interested in the idea of growing shade-grown coffee as a way of sustaining the local growers and preserving some of the native forests in the region. I was wandering if you could suggest any resource to learn about the actual practicalities of growing shade coffee including information on techniques, expected yields, plot sizes, profit projections etc which would help us to make an informed decision about moving into the world of shade grown coffee? Although I have found a lot of background information regarding shade-grown coffee, as well as more specific information mainly to do with biodiversity indices and legislation and the requirements of the shade providing canopy I have been having a lot of trouble finding practical resources for farmers. Jack, you make an interesting point. I have heard from a couple of other producers who were willing to get shade certification that there just wasn't help on the ground to assist them in making the grade. I don't know how pervasive this is, but if true it is certainly a problem! I'd suggest a couple of avenues. First, try the Ecuadorian coffee organization, CORECAF. They should provide some technical assistance. Even if the goal isn't to get certified, it seems to me that Rainforest Alliance or Smithsonian Migratory Bird Center could point you to resources. My contact at SMBC is Robert Rice (http://tinyurl.com/ynuv82). If you can visit or access a university or research library, try searching the literature under "coffee and yield" and similar terms. I am working on a large coffee bibliography and there has been work done on various shade management schemes and their effect on productivity and profit. None specific to Ecuador that I know, so "your mileage may vary." Finally, in August a new edition of a coffee growing "bible" is coming out (http://tinyurl.com/yoebsh). It's expensive, but sounds like it would be very helpful to you. I am interesting in your work and journey down this path! Please consider keeping some sort of diary and letting me know how things are progressing — it would be great information to feature here! You can contact me via email at coffeehabitat AT gmail DOT com.